Telenor buying Vodafone Sweden is the latest on a long shopping list involving the Nordic incumbents. Telenor: buys Vodafone Sweden, starts a multi-brand mobile strategy in Denmark, introduces triple play services over ADSL2+ in Sweden, is interested in a DTT license and buy WiMAX spectrum in Norway, acquires Bredbandsbolaget in Sweden and Cybercity in Denmark, at an earlier stage acquired Canal Digital (pan-Nordic). TeliaSonera: denies market rumours about a possible bid for Telenor and leaves the TDC auction, introduces triple play services over ADSL2+ in Finland and Sweden, acquires Chess/Sense in Norway, at an earlier stage acquired Orange Denmark. TDC: may bid for Finnish mobile operator DNA, acquires Swedish Dotcom, starts an MVNO in Norway on Telenor's network, at an earlier stage acquired Song Networks. Vodafone and Orange have left the region. Vodafone now has Partner Networks in every Nordic country, except Norway. Telenor may well be the next partner. Tele2 left Finland. Will it stay in Norway and Denmark? Telenor, TeliaSonera and TDC will lead the consolidation. Several smaller operators could be up for sale, e.g. : NextGenTel (fixed) in Norway, Elisa (primarily mobile) in Finland. No consolidation to be expected among the three incumbents. With Apax et al bound to be the new TDC owners, interesting times are coming. Any large European telco wanting to enter the market would simply need to buy any of the three incumbents. It would face stiff competition but no regulatory hurdles. This story on PCS Intel seems baseless to me. It reads like a press release - beware. One can only wonder how stock market regulators respond to this. Sprint Nextel would swap the iDEN network for WiMAX spectrum in the 700 MHz band. Would any deal be heavily contested by other (wireless) providers. Were the 2.5 GHz and 5.8 GHz bands reserved for WiMAX in North America. Tele2 is the latest to undercut prepaid mobile pricing in the Netherlands. Tele2 Champion (take a look at their table, but they left out UPC Mobile at 18 and 9 cents, Simyo at 16 cents and 8 cents and debitel at 14 and 7 cents) includes 14 c/min and 7 c/SMS. Vodafone, T-Mobile and Orange haven't followed suit yet. Possibly they are preparing convergence products (boxes), like At Home Talk and Web (Vodafone), UMTS/WiFi box (T-Mobile) and Wanadoo Livebox (Orange). Philips introduces a new product line that will enhance Sling Media's Slingbox performance and lower its pricing (should Sling Media choose to pass on the 20% difference). The Slingbox, for place-shifted TV to anwhere the broadband subscriber happens to be, got great reviews in the US. Sling Media works on a European (PAL) version and called for trial users. The company will present itself at the annual CES in January. Here are some of the deals for user-generated content and related services (blogs, podcasts, vlogs, etc. ), introduced by the dominant players so far this year. Introduces Google Talk for IM and VoIM. Participates in Al Gore's and Joel Hyatt's Current TV, which broadcasts 'viewer created content' (VC2) and updates from Google's top search queries. Expands Yahoo! News Search to include blogs from blo.gs, photos from Flickr and links from MyWeb. Introduces Yahoo! Podcasts (RSS, search). Announces interoperability of Yahoo! Messenger and MSN Messenger (next summer). Introduces Yahoo! Audio Search (includes podcasts) into video search (beta). Trials blog search in South Korea. Starts buying blog statistics from Intelliseek. Acquires the Weblogs Inc network from Jason Calacanis. AIM closes distribution alliances with blog boster Six Apart and web log Glam.com. Distribution alliances of AIM with LinkedIn and Facebook. MTV bought iFilm, which produces a.o. user generated content. CBS.com introduces blogs centered around TV shows. The big five Dutch cable companies, UPC, Casema, Essent, Multikabel and CaiW are setting up a VoIP peering platform. Direct interconnect will save on interconnection fees payable to the telco incumbent, KPN. Google has a similar incentive to construct a GoogleNet. Things however can go bad. Parties have to agree on payments should traffic from any participant exceed the level of the others. Obviously, Cogent and Level 3 didn't work out the details yet. They have until November 9. ... I pick HD-DVD. I have my reasons. Also: usually not the best system wins (remember Betamax) and Philips loses. Recent developments are Warner Bros and Paramount embracing Blu-ray - without giving up support for HD-DVD, however. Microsoft and Intel picked Sony's side at the HD DVD camp. Samsung, a Blu-ray supporter, is supposedly working on a player that will support both formats. And then there is the DivX 6 software, available on an Avel LinkPlayer right now. Also, China is working on a third technology. Voice calls will never be absolutely free. VoIP isn't really mature today. VoIP will capture 30% of the residential fixed voice market in 2010 and won't approach 100% until 2020. Global portals like MSN, AOL, Yahoo! will never be able to claim national consumer VoIP market leadership in any Western European country. Pro-active incumbents launched flat-rate PSTN calling. By launching VoIP services, ADSL bundles, and enhanced functionality services, incumbents are fighting the pure plays on their own turf. Incumbents have many advantages in brand names, customer base, billing, financial strenght. The best pure plays can hope for is to be acquired or to license their often interesting technology and service concepts. On October 14 the Skype deal closed and eBay paid the initial $1.3 bn (and 33m shares). The corporate jet was sold for $28.3m (see page 11 of the Q3 earnings release). They threw this at the Q3 capex budget. CFO Rajiv Dutta transitions to Skype (see page 1 of the same release). CEO Meg Whitman unsuccesfully interviewed at Disney for the CEO post now given to Bob Iger. EBay is to pay a maximum earn-out to the Skype sellers worth $1.4 bn in cash or stock (at eBay's discretion). EBay understands that phone calls (VoIP) will be free within 3-6 years. To be sure, I find it hard to see logic in the (price of the) Skype deal, except when you see it as a way to diversify, which Ray Conley explains very well. Deutsche Telekom: have two flat-rate subscriptions for the price of one (10 EUR/mo) from T-Com and T-Mobile. Free F2F calling locally and free M2F calling in two selcted towns. Mobistar, part of Orange in Belgium, introduces ADSL + VoIP. Discounts for mobiel subscribers. Verizon Wireless introduces a Samsung music phone. KPN orders triple play gear from Alcatel. T-Mobile introduces web'n'walk, lastly in the UK. KT Corp will trial a converged network for triple play services. Cingular is rumored to be working on an UMA phone for fixed, cellular (HSDPA) and WiFi access. BT introduces Datazone: datacards for access through WiFi or 3G networks. Google, at its cooperation with NASA, metioned 'bio-info-nano' convergence, whatever that may be. Woosh, using IPWireless gear, starts VoIP over TD-CDMA. China Unicom trials BridgePort for VoIP over wireless. My previous post brings me to a whole range of bottlenecks that are sometimes not fully acknowledged, or so it seems. 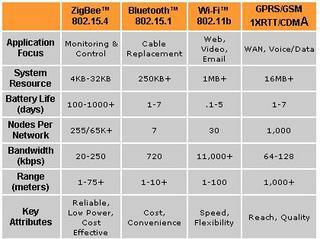 Distance and LOS for BWA (and other wireless) networks. Spectrum for wireless in general. Take a look at this if you think you can watch TV over 3G. Backhaul for 3G. That's exactly why MSOs are looking at this rapidly growing market. Network sharing in cellular and cable TV networks limits bandwidth available to the end user. Interoperability issues. Yahoo! Messenger and MSN Messenger are finally hooking up. Roaming issues in mobile (cellular) and nomadic (WiFi) networks. For WIMAX to be succesful, it needs scale. For scale, it needs the residential market. To be competitive to DSL and cable modem internet, the cost may not exceed some 30 EUR/month. This can only be done with self-install CPE. Self-install CPE is necessarily indoors. Which implies the need for NLOS. Much touted bit rates (up to 120 Mbps) and reach (up to 30 miles) are therefore much lower in realistic environments. This goes for NLOS product offerings from vendors like Navini, Alvarion, Clearwire and Redline. It is kind of hard to get these kinds of data from those companies, but thanks to picoChip we have the above figure. We are talking 2 km max, and bit rates probably in the 2 Mbps ballpark. Now that's a whole different business model (more base stations!). Final note: providers may disagree on the reasoning. Enertel Wireless for one so far focuses on the business markt. But then, it uses LOS systems, which can provide 5 Mbps symmetric over a distance of 10-15 km. Newspaper stocks are generally down this year. New York Times -30%, Tribune -22%, Washington Post -22%, Gannett -19%, Knight Ridder -16%, Dow Jones -15%. Internet usage and broadband explode. The rise of Google, Yahoo! and blogs for news. The rise of eBay, Craigslist, etc. in the classifieds market. Revenue from online ads is simply lower than for print ads. Second, several other sections of the advertising market show rapid growth. Third, advertisers are consolidating (Federated/May) and several industries face difficult times (automotive, film). Interestingly, the New York Times is launching OnMovies in December, an in-cinema magazine free to ticket buyers. It is to be fully advertising funded. Newspapers are moving online and should embrace blogs, podcasts, etc. Free sheets and magazines can capture a so far untapped slice of the ads market. Newspapers, like telco incumbents, must shrink their way to excellence. Brightcove, a video-on-demand start-up, has chosen a business model. Operations start early next year. See my previous post of May 31. Three services center around delivering video through the internet. This will deliver larger audiences to video producers, while allowing them to monetize their content. See also the picture over here. 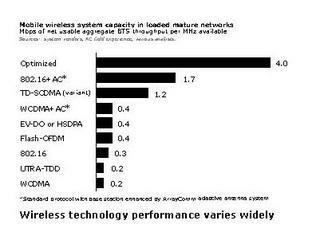 Here's an overview of short-range technologies (and cellular) from Dailywireless.org. For anyone wondering what is costs to scan a book, the University of California gets at 10 cents/page. (See Yahoo! 's support for the Open Content Alliance.) For the 18k planned books, assuming an average 200 pages, that sums up to just $360,000. The top line (optimized) represents ArrayComm's iBurst technology. IFPI reports that worldwide digital music sales (downloads, streams, subscriptions, burns) almost quadrupled to $790 during the first half. That constitutes 6% of all music sales, versus 1.6% last year. Add to that the demise of some P2P file-sharing networks (see below), and things start to look a lot rosier for the likes of iTunes. However, MSN seems to think it is late to the party, breaking off talks with music's Big Four. Of the two pure-play stocks, Warner and EMI, Warner gained 28% since a low on July 7. Grokster was found liable for damages by an American judge (June 27). An Australian judge ordered Kazaa to go legal (September 5). The RIAA orders P2P networks to 'cease and desist' (September 16). BitTorrent, among the largest networks, attracts $8.75m in venture capital (September 27). Limewire goes legal by changing its technology (September 27). eDonkey-owner MetaMachine quits this P2P technology (September 30). Related news from the movie industry: the MPAA forms MovieLabs to fight piracy through technology (September 19). Google: megalomania or ... ? Google's highspeed innovation strategy draws two very similar comments, from Breakingviews (subscription) and Robert Cringely (RSS feed). Breakingviews: "While it's possible Google's $90bn market cap has bred megalomania, there may be a method to this apparent madness. Indeed, Google's value isn't simply a reflection of investors' hopes it will remain the dominant search engine. They are also expecting it to branch into new businesses." Some quotes from I, Cringely: "What the heck Google is up to is a favorite topic of conversation this week in high tech circles. It's just a hunch of mine, but with more than $2.5 billion in cash already on-hand, I don't think Google has any plans at all for that extra $4 billion. What Google WILL do is roll-out incremental products at a blinding pace. Not long ago, PayPal co-founder Max Levchin explained to me that rapid development is an important key to market dominance. "What you want to do," he said, "is listen to your customers and bring out every two weeks improved versions that would each take your competitor two months to complete. That's when you are on a rocket -- they can't keep up so they can't compete. They lose hope and pretty soon you have the market pretty much to yourself. "That pace of technical development, which probably isn't sustainable for long at any company, isn't POSSIBLE at all at more mature companies like AOL, Yahoo, and especially Microsoft. Google likes to play the Black Box game. What are they DOING in all those buildings with all those PhDs? I'm sure they are doing a lot that will change the world, but just as much that will never even be seen by the world. For the moment, though, it doesn't matter because Google can play the spoiler. Google likes being a mystery, too. Microsoft is totally obsessed with Google because Bill Gates is obsessed with Google. In a way, Bill needs a bogeycompany like Google to motivate the troops, since they are no longer being wowed by Microsoft's stock performance. Not long ago, I spoke with someone from MSN who said the mood there was so tight that his co-workers were acting like mad dogs." This week's 'Den Haag Telecom 2005' and the preceding evening seminar in Amsterdam, hosted by Citynet (many links there) showed some insightful (if not really new) reasoning from high-profile bloggers versus not more than post-bubble vagueness from telco officials. James Enck (EuroTelcoBlog) talked about the 'Attack from Cyberspace', i.e. Skype/eBay, Google, Microsoft, Yahoo!, AOL. And then, who knows what News Corp and Amazon.com are up to. Martin Geddes (Telepocalypse) was equally pessimistic on incumbent telcos in his expansion of David Isenberg's concept 'The Stupid Network'. The telco guys disappointed. They sounded like they were explaining (in 2001) what went wrong (when the bubble popped in 2000). Michiel Buitelaar (KPN): "No longer will TV companies decide at what time I should watch a certain program." And also: "People do not want to ADSL, they want to access the internet." Recent developements (below) around Walt Disney all point in the same direction: the company is looking for more ways to leverage and distribute its content. The Moviebeam project (a proprietary STB for VoD, filled with 100 movies that were beamed along the ABC-network station transmissions) was cancelled and Disney doesn't own a cable (like Time Warner) or satellite (like News Corp) company. The new Mobile ESPN MVNO will launch before the Holidays. Next year another MVNO, Disney Mobile, will follow. Both will use the Sprint Nextel network. Earlier this month Hong Kong Disneyland opened. Discussions are ongoing over parks in mainland China and in South Korea. Even though Moviebeam was abandoned, Disney started working with Swiss Kudelski on a new STB (for outside North America and Japan). Disney licensed several channels to Verizon, for use in the new FiOS TV-over-fiber product. Disney is interested in WiMAX. This week Disney launched the 'Mix Stick' MP3-player, although the company doesn't own a full-blown record company.